The cell. 5. Vesicular trafficking. Endoplasmic reticulum. Atlas of plant and animal histology. Endoplasmic reticulum is a complex membrane-bound compartment arranged in tubules and flattened cisterns interconnected and sharing the same lumen (inner space) and membrane. Endoplasmic reticulum membrane is also continuous with the outer membrane of the nuclear envelope. 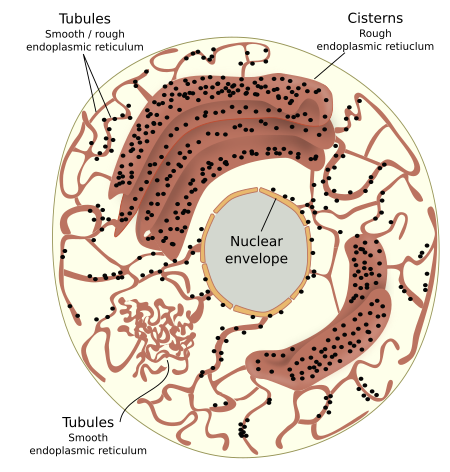 Tubules and cisterns are distributed trough the cytoplasm from the nuclear envelope to close to the plasma membrane, so that they can account for half of the total cellular membranes. Endoplasmic reticulum membrane is thinner (around 5 nm in thickness) than other organelle membranes because they have lipids with shorter fatty acid chains. Endoplasmic reticulum membranes are organized in domains or regions that carry out different functions. At transmission electron microscopy, it is easy to distinguish two domains: rough and smooth endoplasmic reticulum (Figure 1). Rough endoplasmic reticulum membranes are arranged forming cisterns and more or less straight tubules, both having many ribosomes associated to their cysotolic membrane surface (that is why the name rough). Smooth endoplasmic reticulum is organized in irregular and convoluted tubules, with no associated ribosomes. The outer membrane of the nuclear envelope may regarded as part of the rough endoplasmic domain because it is physically continuous with the membranes of the rough endoplasmic tubules and it has many associated ribosomes doing translation. Rough and smooth endoplasmic reticulum do not usually share the same cytosolic space. This non overlapping distribution is observed in hepatocytes, neurons and cells synthesizing steroid hormone. However, in some cytosolic regions there is not clear segregation between both domains, and tubules with associated ribosomes are intermingled with naked tubules. The spatial distribution of the endoplasmic reticulum through the cytosol is set by the cytoskeleton, mostly microtubules in animal cells, whereas actin filaments are the major responsible for the endoplasmic reticulum distribution in plant cells. Rough endoplasmic reticulum is organized in more or less straight tubules and flattened cisternae. Sometimes, cisternae are tidily piled. 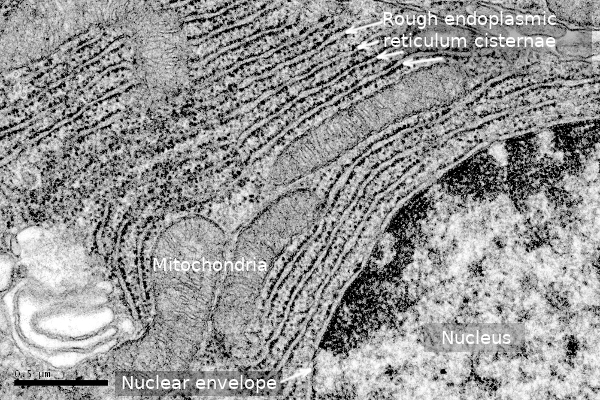 The name "rough" comes from the electron microscopy images where ribosomes, black particles, are observed coating the endoplasmic reticulum membrane (Figure 2). The density of associated ribosomes influences the rough endoplasmic reticulum membranes organization, so that a high density causes a cistern-like morphology, whereas lower density is found in tubules. Cisternae and tubules coexist in the same cell, but those cells with an intense secretory activity show dense piles of cisternae, which means a highly developed rough endoplasmic reticulum. Fiigure 2. Transmission electron microscopy image. Rough endoplasmic reticulum cisternae are observed, which extend from the nuclear envelope to the proximity of the plasma membrane. Ribosomes are observed as black dots associated to endoplasmic reticulum membranes. Note ribosomes associated to the outer membrane of the nuclear envelope as well. Protein synthesis is the main function of the rough endoplasmic reticulum. These proteins end up at different places, such as the extracellular space, plasma membrane, or at membranes and lumen of several organelles involved in the vesicular trafficking, such as Golgi apparatus, endosomes, and lysosomes. Many proteins will be part of the plasma membrane, and of other membranes, as transmembrane proteins. Furthermore, rough endoplasmic reticulum needs to synthesized proteins for itself, which are known as resident or constituent proteins. Keep in mind that each protein should "know" its correct destination in the cell. This can be accomplished by a signal peptide (short sequence of amino acids) or specific modifications of the protein, which work as postal addresses. For example, endoplasmic reticulum resident proteins contain a four amino acid sequence close to the end carboxyl group. Almost any protein targeted for secretion or being part of a compartment of the vesicular traffic begins to be synthesized in cytosolic free ribosomes, but the synthesis ends in the endoplasmic reticulum, leaving the protein either free in the lumen or as part of the reticulum membrane. The process of protein synthesis starts when an mRNA, which carries information for a protein of the vesicular trafficking, joins to a small ribosomal subunit, and then to a large ribosomal subunit, to begin the translation (Figure 3). The first translated segment of the mRNA is a sequence of amino acids known as signal peptide, which is about 70 amino acids long. This sequence is recognized by a cytosolic molecule referred as SRP (sequence recognition particle). SRP is a mix of 1 RNA and 6 polypeptides that joins to the signal peptide and slows vdown the translation process. The mRNA-ribosome-SRP-signal-peptide complex diffuses through the cytosol until it hits a rough endoplasmic reticulum membrane. 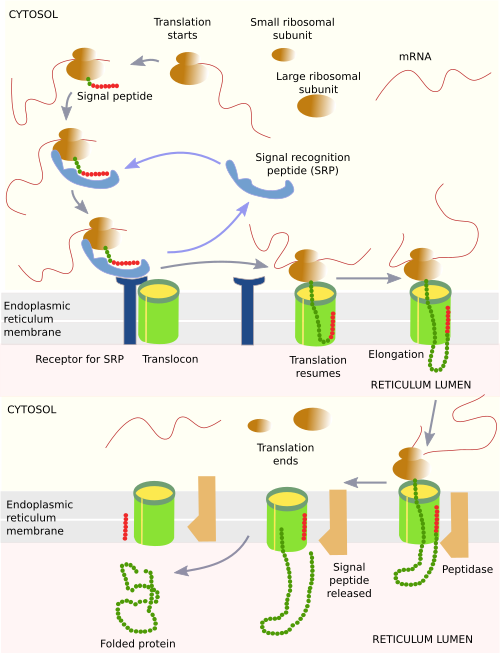 In these membranes, there are SRP-receptors which recognize the SRP. The whole complex becomes attached to the membrane and then interacts with a translocon, a large transmembrane protein with a channel. Then, SRP and SRP-receptor are released and mRNA-ribosome-signal-peptide attached to the translocon can resume translation, but the nascent polypeptide grows now inside the translocon channel. The signal peptide gets fixed to the channel walls, while the rest of the protein is falling into the lumen of the endoplasmic reticulum cistern. The signal peptide is removed by a peptidase, and once completely translated, the new protein is released and remains free in the lumen, and quickly is folded to get a proper spatial conformation helped by chaperones, another type of proteins. When translation is finished, the ribosome-mRNA is disengaged from the translocon, and the three are free in the cytosol for another round. Figure 3. Synthesis of soluble proteins that are released into the lumen of the endoplasmic reticulum. Transmembrane proteins contain sequences of hydrophobic amino acids. When these sequences are being translated and going through the translocon channel, they can cross the wall of the translocon and be among the fatty acid chains of membrane lipids. The process is rather complex and diverse depending on the protein. For example, some receptors are transmembrane proteins with a chain of amino acids that can cross seven times the cell membrane, by means of alternating hydrophobic and hydrophilic amino acid sequences. There are other proteins spanning just one monolayer of the membrane, and they have to be either in the cytosolic monolayer or in the monolayer facing the lumen. Although it is no common in animal cells, rough endoplasmic reticulum may import some proteins completely synthesized in the cytosol by a process known as posttranslational translocation, which is mediated by chaperones. Proteins in the rough endoplasmic reticulum are modified while they are being synthesized. a) Asparagine amino acids are glycosysilated (N-glycosylation) with a molecular complex composed of 15 monosaccharides. This molecular complex is first assembled into a molecule of dolichol phosphate, a membrane lipid, and then is transferred to an asparagine of the nascent protein. In the Golgi apparatus, some terminal monosaccharides of this complex will be lost and other saccharides will be added. b) Some proteins, mostly those targeted to the extracellular matrix, are hydroxylated. In this way, proline and lysine amino acids of the collagen molecules end up being hydroxyproline and hydroxylysine amino acids. c) Some proteins of the plasma membrane are chemically bonded to some membrane lipids. This chemical bond is also established in the rough endoplasmic reticulum. d) Disulfide bonds between polypetide chains are also formed in endoplasmic reticulum. A quality control of synthesized proteins occurs in the rough endoplasmic reticulum, so that those defective proteins are removed from the reticulum and degraded in the cytosol. Proteins known as chaperones, which are needed for a proper folding of newly synthesized proteins, also play an essential role in detecting defective proteins and labelling them for degradation. Other proteins bearing lectin domains are able to detect and recognize wrong arrangements of carbohydrates. Wrong folding of nascent proteins, which may lead to cell damages, is more frequent than one may imagine. Smooth endoplasmic reticulum is a network of interconnected tubules, which are continuous with the rough endoplasmic reticulum. There are no ribosomes associated to its membrane, therefore it is named smooth, and the majority of proteins in this compartment comes from the rough endoplasmic reticulum domain. Smooth endoplasmic reticulum is abundant in those cells involved in lipid metabolism or detoxification, and is also an organelle for calcium storage. Most membrane lipids are assembled in the smooth endoplasmic reticulum, including glycerophospholipids and cholesterol. The components of the glycerophospholipids come from other parts of the cytoplasm and assembled in the membranes of the endoplasmic reticulum. Fatty acids are inserted in the cytosolic monolayer of the organelle membrane. Glycerophospholipid heads are then linked to these fatty acids. Most part of the sphingolipid synthesis, however, happens in the Golgi apparatus, but ceramide, the basic component of sphingolipids, is assembled in the smooth endoplasmic reticulum. Once glycerophospholipids and ceramide are complete assembled, they are initially located in the cytosolic monolayer of the endoplasmic reticulum membrane. Since flip-flop movement is nearly forbidden for lipids by the hydrophobic environment of fatty acid chains, lipids need help to be transferred to the other monolayer (that facing the lumen). There are specialized proteins that can move lipids from one monolayer to the other: flippases, floppases and scramblases. Figure 4. Suggested ways for transferring lipids between cellular membranes: vesicular trafficking, carriers and membrane contacts. Transferring lipids between membranes is done by vesicles, molecular carriers and at membrane physical contac sites (Figure 4). Vesicles, through vesicular trafficking, transport in their membranes lipids synthesized in the endoplasmic reticulum to other organelles. Mitochondria, chloroplasts and peroxisomes are not part of the vesicular traffic, so some membrane lipids are synthesized locally, but many others are imported from the endoplasmic reticulum by molecular carriers. For example, glycerophospholipids are transported by a cytosolic protein known as glycerophospholipid interchanger. It can take a lipid from the membrane of the smooth endoplasmic reticulum and leaves it in the membrane of other organelle. Furthermore, many electron microscopy images show physical contacts between membranes of different organelles, for example between endoplasmic reticulum and mitochondria or peroxisomes. These contacts may facilitate interchange of lipids between different membranes. Chloroplasts can synthesize their own glycerophospholipids and glycolipids. However, endoplasmic reticulum membranes and chloroplast membranes are also observed very close to each other in electron microscopy images. Cholesterol is mostly synthesized in the smooth endoplasmic reticulum. It is an important molecule for membranes, particularly for the plasma membrane. 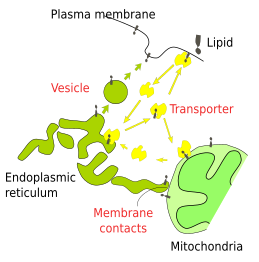 Cholesterol is transported by vesicles and molecular carriers from the endoplasmic reticulum to the plasma membrane (Figure 4). In yeasts, that have ergosterol in their membranes instead of cholesterol, the main mechanism to move ergosterol from the endoplasmic reticulum to the plasma membrane is a diverse set of transporters. This transport does not need ATP. Triacylglycerols are synthesized in the smooth endoplasmic reticulum. These lipids are stored in the reticulum itself or as lipid droplets. The synthesis of triacylglycerols is intense in adipocytes, the fat storing cells of animals. The overproduction of lipids is stored in cytoplasmic lipid droplets. This fat-storing organelle works as an energy source for the body when needed, and in some species for thermal insulation as well. Triacylglycerols are also part of the lipoproteins, and requiered for the production of steroid hormones and bile acids. Hepatocytes, the liver cells, show a highly developed smooth endoplasmic reticulum. In the smooth endoplasmic reticulum membranes, the P450 protein family is in charge of removing potentially toxic metabolites, as well as liposoluble toxins incorporated during the digestion. The shape of the smooth endoplasmic reticulum tubules, and the lack of ribosomes, allows a large surface of membrane related to the organelle volume. In addition, it is able to increase the length of the tubules to make room to all these enzymes, which in turn it depends on how many toxic substances the animal body contain. Glucose is usually stored as glycogen, mainly in the liver. Two hormones regulate the glucose release from the liver to the blood: insulin and glucagon. Catabolism of glycogen produces 6-phosphate glucose, which cannot cross the cell membrane, and hence cannot leave the cell. Glucose 6-phosphatase, which is anchored to the endoplasmic reticulum, removes the phosphate residue allowing glucose to be moved out of the cell. Smooth endoplasmic reticulum also works as a storage compartment for cytosolic calcium. Calcium is transported into the lumen by calcium pumps located in the organelle membrane. Calcium concentration in the smooth endoplasmic reticulum is in millimolar (mM), whereas in the cytosol is in nanomolar (nM). Stored calcium is released by extracellular and intracellular signals acting via second messengers, resulting in a cellular response, for example exocytosis. A remarkable example is the endoplasmic reticulum of the muscle cells (known as sarcoplasmic reticulum) that captures and releases calcium to produce a cycle of muscle cell contraction and relaxation. English AR, Zurek N, Voeltz GK. Peripheral ER structure and function. Current opinion in cell biology. 2009. 21:506-602. Daleke DL. Phospholipid Flippases. The journal of biological chemistry. 2007. 282:821-825.